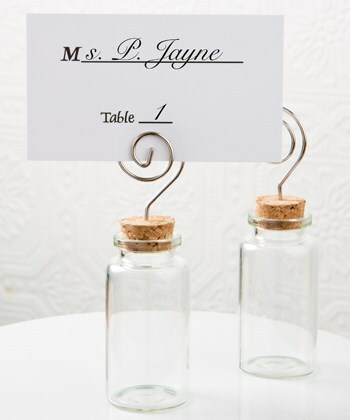 This simple and clever idea as a place card holder will charm your guests when you fill the jar with exotic spices or homemade treats! Add a personal touch to your event tables when you mark each guest's place with a fabulous little glass jar filled with wonderful delights. Try some spices, honey, jam or homemade fudge. You can also fill them with beads, small gadgets, charms or a secret message! The glass jars are closed with a tight seal cork top that supports a coiled wire. Place your card into the scroll to mark the seating arrangement at your event. When your guests take these favours home, they can use them to display special photos. You can easily remove the wire if you prefer not to have this option. Add a fun and unique favour to your event tables with these little glass jars! They are ideal for weddings, showers, birthdays, anniversaries and other grand occasions. A fabulous favour for weddings, showers, christenings and any occasion where good wishes are needed!